GlassMountains Blog – Exploring the backcountry and wilderness of the Western USA.GlassMountains Blog | Exploring the backcountry and wilderness of the Western USA. This past Wednesday I joined the Southern Arizona Hiking Club (SAHC) for a climb of Picketpost Mountain, a peak rising to the west above Superior, Arizona. 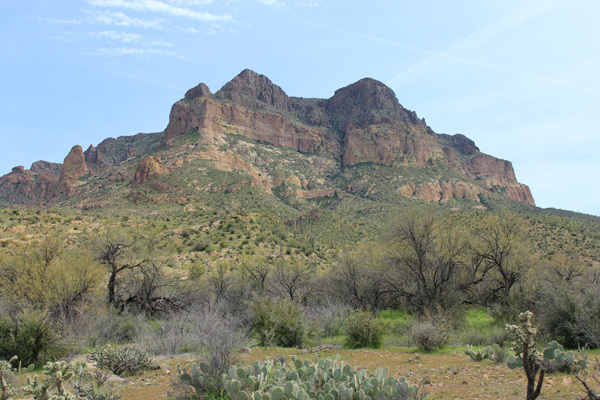 Picketpost Mountain has only 4375 feet of elevation but 1455 feet of topographic prominence, making it the 160th most prominent peak in Arizona. 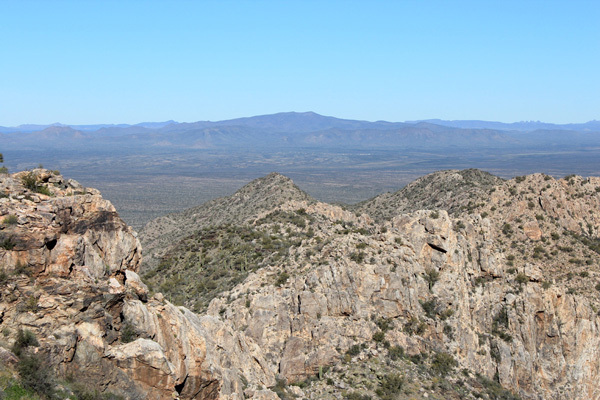 Picketpost Mountain is one of the 415 Southern Arizona Hiking Club Peaks and one of the 45 SAHC “Emblem Peaks”. From US Highway 60 the mountain appears surrounded by high cliffs and steep, narrow gullies. I have wanted to visit it since Linda and I visited the nearby Boyce Thompson Arboretum State Park a few years ago. On Saturday, March 2, I joined Matthias Stender, Scott Peavy, and Michael Vincent on a climb of Mesquite Benchmark, the highpoint of the Mesquite Mountains of Pinal County southwest of Sells, Arizona. Mesquite Benchmark has 3789 feet of elevation and 1769 feet of topographic prominence, tying it as the 98th most prominent peak in Arizona. 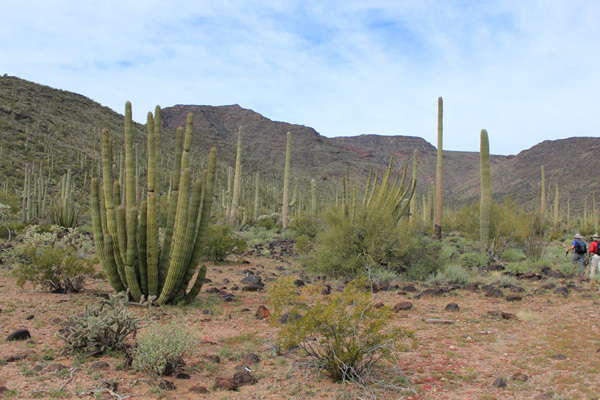 Saguaro cactus are joined by organ pipe cactus as we enter the canyon below Mesquite Benchmark. I met the others where Indian Road 21 heads south off AZ 86 Saturday morning. From there we drove south through the village of Pisinimo and by a few isolated residences. We encountered very little traffic south of Pisinimo except for several Border Patrol vehicles heading in both directions. The paved road deteriorated quickly. On Sunday, February 17, I joined Eric Kassan, Stacey Samuels, and Adam Humphreys on a hike of Cimarron Peak in Southern Arizona. Cimarron Peak lies west of the village of Kaka and north of the village of Hickiwan, Arizona. The peak has been of interest to me for several seasons in Arizona. It has only 4124 feet of elevation, but 1984 feet of topographic prominence, making it the 74th most prominent peak in Arizona. 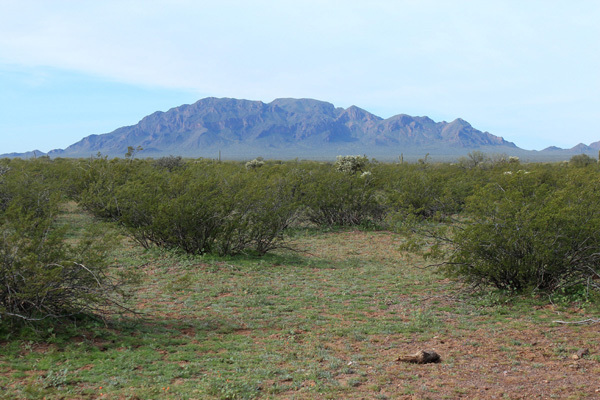 Cimarron Peak also has 26 miles of isolation, meaning the nearest peak higher than it is 26 miles away. This makes it the 36th most isolated peak in Arizona. It certainly feels isolated, as it is miles from paved roads and the road providing best access to it has some nasty erosion in spots. Cimarron Peak has few visitors and visiting it seems an adventure in exploration. On Saturday, February 16, Eric Kassan, Stacey Samuels, Adam Humphreys, and I hiked up South Mountain of Pinal County west of Sells, Arizona. South Mountain has about 4160 feet of elevation and 2020 feet of topographic prominence, making it the 70th most prominent peak in Arizona. This was my second visit to South Mountain. We met on Arizona Highway 86 and I led our drive in on primitive roads through a lush and green desert. On the way I spooked four jackrabbits at different points. I had last visited South Mountain in November 2017 and had driving notes from that drive. But I was surprised how a recently graded road then had become eroded in only two years.